Christiana Axelsen. Photo: Ian Douglas. What Axelsen does have can’t be faked by technical mastery: a halo of an interior consciousness. If her dancing were a kind of speech, it would be a quiet voice—the sort of voice that everyone hushes in order to hear. All performance requires a kind of amnesia. The dancer leaves behind the rote repetitions of rehearsals, finding the choreography anew in what looks like a spontaneous train of motion. Axelsen’s dancing has the quality of an improvisation, as if it’s being created for the first time. Occasionally she breaks into a smile; not a flashing of teeth to the audience, but an expression of pleasure and surprise at what her body can do. She conveys a joy in the sheer sensation of movement—an emotion rarely found in postmodern dance’s obsession with the impersonal. This public communication of a private feeling creates a unique sense of intimacy. In order to rid performance of its performative nature, dancers of the “downtown” scene often ignore their audience, refuting the onlooker’s gaze with blank and expressionless faces. Axelsen isn’t expressive per se, but she breaks the usual barrier down, her lack of inhibition allowing you to share in her visceral experience. The effect of watching her dance is like watching a blind person listen to a piece of music. The sounds overwhelm her highly attuned senses, while you, half-deaf, try to catch on. Yet you can begin to understand what she hears, vivid as it is, by witnessing her experience of it. 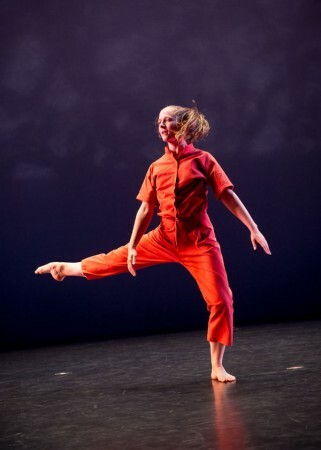 Whatever sensation Axelsen discovers in her dancing, it leaves one wishing to see what she sees, and feel what she feels. She invites you to follow along with a warmth and openness. And the training is there (primarily via Merce Cunningham), though her self-assurance hides the difficulty of the more extreme choreographic elements. During a series of turns in Molissa Fenley and Company’s recent work at the David Rubenstein Atrium, Axelsen changed her focus, or “spot,” after almost every rotation, all the while traveling through a mass of bodies. She can balance on demi-pointe, one leg lifted, for what seems to be like minutes on end. Her unflinching execution of these feats effectively silences their technical demands; to the untrained eye, they might look ordinary. No matter the choreography or setting, her range allows her to explore the extremities of speed and scale, from the physically intensive to the subtlest of motions. Christiana Axelsen will perform new work with Molissa Fenley and Company from Oct. 9 – 11, 7 pm, at the Flea, 41 White Street, Manhattan. For further info, visit molissafenley.com.